Spruce up your birding sanctuary with the Wing and A Prayer Camellia Bird Feeder with Hammered Copper Roof. This beautiful piece combines a hopper feeder with a platform feeder to feed several of your favorite birds. The clear plastic hopper holds two quarts of mixed or other seed, inviting a variety of songbirds to visit the feeder. Place fruit, mealworms, or suet on the platform to feed specific types of birds. Several birds can feed from the six seed ports, and the platform offers additional perching room. The steep roof and decorative finial prevent water from entering the reservoir and ruining the feed, and the clear plastic tube allows seed levels to remain visible at all times. The paneled white columns and arches of this feeder evoke the charm of a beach house. Crafted from solid PVC trimboard, this feeder will not mold, mildew, or delaminate, for years of use. The trimboard is stable for 25 years and resists water, so joints will not swell or crack. The roof is covered copper colored galvanized metal, enhancing the beauty of the feeder. A white trimboard finial completes the piece, and can be removed easily for quick cleaning and refilling of the reservoir. 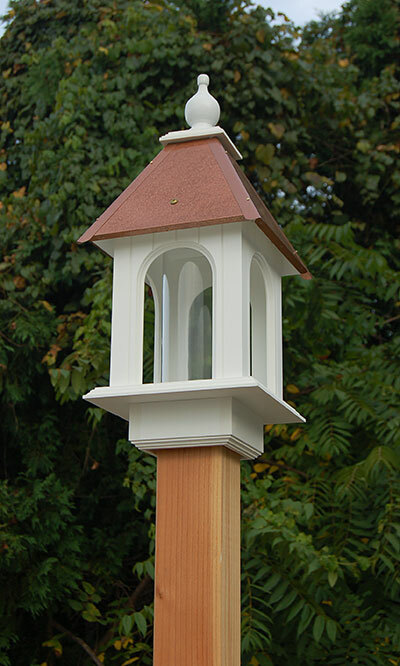 Mount this feeder on any square 4" x 4" post (not included) for easy visibility. Keep your garden full of birds with the Camellia Bird Feeder with Hammered Copper Roof. Handmade in the USA.